Maneuver your way from the early days of 4-bit games to the majestic 128-bit era in Bit Boy, Bplus' latest WiiWare offering. Bit Boy's friends have been scattered throughout video game history, and it's up to him to travel through the various eras in order to find them. A simple collect-the-dots game, Bit Boy's hook is the fact that after five levels of wandering around avoiding enemies and collecting friends, you then progress to the next generation, where you avoid even more enemies and collect more friends, only things look a bit better. It's a very intriguing hook, but do the creators of WiiWare's Plättchen Twist 'n' Paint and Niki - Rock 'n' Ball have the chops to make it truly shine? The Concept: The concept behind Bit Boy is rather clever. Taking a simple 4-bit maze collection game and advancing it bit-by-bit (sorry) through the various recognized eras of gaming is the sort of idea that makes gamers - especially aging gamers - sit up and take notice. The Execution: The flash of inspiration that delivered this amazing concept to Bplus seems to have quickly fizzled out once the studio got around to crafting an actual game. The simplistic game play that is so charming in the 4-bit and 8-bit eras quickly loses said charm once you realize that moving about poorly-designed maps while avoiding enemies hell-bent on wandering aimlessly about block your path is all you will be doing for the rest of the game. It's even worse once you hit the 3D levels, where the horrible camera forces you switch camera angles to the same top-down perspective you've been using all along. The More Things Change: Bit Boy's game play isn't the only aspect of the game that fails to change with the times. Music and sound effects remain largely the same throughout the course of the game, as does the overall presentation. You get the same early-arcade start and high score entry screens no matter what era you've just left, which only serves to remind you that you're playing the same game with updated graphics over and over again. Bit Boy had the potential to be an interesting study in how video games have evolved over the years, from their primitive beginnings to their current-day 3D glory, and to an extent it succeeds. Watching the crude graphics slowly evolving with each new level is initially fascinating. I couldn't wait to see what was coming next. Unfortunately Bit Boy only gets the idea half right. Rather than being an evolution of the video game, it's merely the evolution of video game graphics. Coupled with frustrating and bland game play, we're left with an unpleasant reminder that it takes much more than enhanced visuals to make a video game "next-gen."
Bit Boy's field trip through video game history would have been a great deal more enjoyable if the fun hadn't fallen off the bus back in the Atari 2600 era. 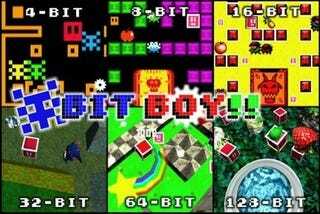 Bit Boy was developed by Bplus and published as WiiWare on July 13th. Retails for 600 Wii points. Played the game from beginning to end several times, each play through taking under an hour to complete.